According to Environmental Protection Agency site coordinator Michael Arnett, 78 percent of the clean up project at the American Creosate site has been completed, including excavation of the site. Arnett said presently the U.S. Corp of Engineers and the company CORE have been working on cleaning up the site with the project moving along very well. Final clean up for the American Cresoate Superfund Site began in January 2012. Total cost of the project will be $24 million. The remaining 50-acres will be set aside for the onsite burial of all contaminants. Conceptual plans are already underway as the city of Louisville and Winston County work together to create a marketable space for the industrial park area. Louisville Mayor Will Hill agrees the site will be an asset to the community. “This is, in my opinion, one of the most positive and promising projects for the future of Louisville, Mississippi,” Hill said. Hill said the superfund site, over the past couple of decades, has amounted to roughly 100 acres of useless space for the community. The cleanup of this property is scheduled to complete in 2015 and upon the appropriate clearance given, the property will be turned over to the City of Louisville for the purpose of marketing for redevelopment. The EPA superfund site is located off Highway 15 at the intersection of South Railroad Avenue and Baremore Street. 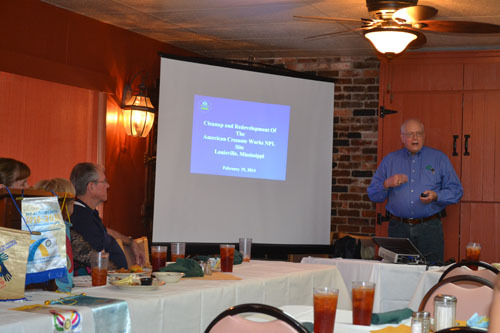 It has been under EPA and Mississippi Department of Environmental Quality supervision since 1985. The Army Corp of Engineers bid out the project with CORE Engineering and Construction Inc. of Florida contracted to do the clean up. According to the original plans for the Superfund project, the cleanup will create an encapsulated cell on 24 acres of the 120 acre site to seal in all the contaminates on the site and build a containment wall around the 24 acre cell to prevent any water or soil contamination in the future. The 24-acre landfill will remain under state ownership and EPA monitoring. To help in creating a barrier during the cleanup and to help give the 24 acre landfill a cushion the EPA purchased an additional 10 acres from private property owner near the site. The cleanup is being funded through 90 percent of federal monies and 10 percent of state funds. According to the EPA Superfund site survey, The American Creosote Works operated intermittently in Louisville under several owners from 1912 until approximately 1997. The property is currently vacant and is owned by the State of Mississippi. The site is located in the City of Louisville divided into two areas by Baremore Street. The northern area encompasses about 50 acres, on which the majority of the former facility operations took place. Several of the old American Creosote Works (ACW) facility structures and equipment still remain on site, isolated on the northwest portion of the property, just east of a residential neighborhood. The lake is known to contain creosote waste. The southern area encompasses approximately 70 acres, including a wood chip pile area located in the southeast portion of the property. It has been reported that the ACW facility mixed waste creosote and sludge from the tanks and cylinders with wood chips and piled the waste in this area. See this story in The Winston County Journal at http://winstoncountyjournal.com/?p=7642.